A two-way radio (also known as a walkie talkie) is one of the most reliable communication tools. They transmit and receive messages over radio frequencies, which means that you can stay in contact in remote locations where other communication devices, like cellular phones, won’t work. 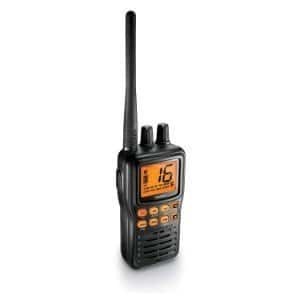 Since they’re so reliable, there are dozens of two-way radios on the market, including basic devices, as well as radios that are specifically designed for certain functions; business two-way radios and hunting two-way radios, for example. While these devices are certainly handy, they may be lacking a very important feature: the ability to withstand water. Which one is the right option for you? Read through the following reviews to learn more about each model. When you’ve decided on one that you’d like to invest in, click on the yellow link to find the best prices currently available on Amazon. The first option on our list is the Motorola MS355R FRS Waterproof Two-Way. It’s a waterproof, long-range two-way radio, so not only can you use it on water and in all types of weather, but you can also communicate over long distances. When you choose this model, you’ll receive a set of two devices that have a range of up to 35 miles (in unobstructed areas). Both devices are meet IP-67 standards, meaning that they can be submerged under water that’s 1 meter deep for up to 30 minutes, so if you’re stuck in a downpour or you drop a walkie talkie in a puddle or creek, you’ll have peace of mind knowing that it won’t be damaged; plus, they float for easy retrieval. These devices are also equipped with voice recognition technology and come home with a two-way radio headset and earpiece, so you can keep your conversations discreet while keeping your hands on task. These walkie talkies can be used as a weather radio, too, because they get seven NOAA channels and emergency alerts; if there are any storms or dangerous conditions on the horizon, you’ll be able to prepare accordingly. With the Motorola MS355R, you’ll receive everything you need to enjoy long-range, hands-free communication, including two waterproof camo radios (great for hunting) radios, two belt clips, two PTT ear buds, two NiMH rechargeable batteries, a dual drop-in charger and a charging adapter, and even an emergency preparedness guide. Final Verdict: With the Motorola MS455R FRS Waterproof Two-Way, you’ll get two waterproof, long-range walkie talkies that are IP-67 standard waterproof that are easy to use and offer great reception. You’ll also have access to weather alerts so you can stay safe in emergency conditions. 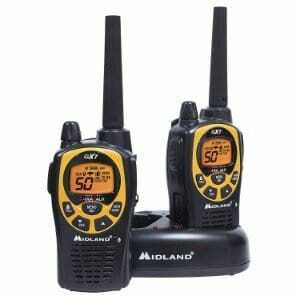 The Midland –GXT1030VP4 is another high quality waterproof long-range walkie talkie. With a range of up to 36 miles, you can keep in touch over vast unobstructed distances in remote locations. The GXT1030VP4 comes with two devices that feature JIS4 waterproof protection, which prevents them from being damaged by splashing water. While they can’t be fully submerge in water, they can resist splashes. In addition to waterproof and long-range technology, these Midland walkie talkies are outfitted with Easy Voice and Sound Activation (eVOX) with nine sensitivity levels, so you can enjoy hands-free communication. You can enjoy discreet communication, too, as there are a total of 3,124 channel options to choose from. With NOAA weather scan and alerts, these devices will scan through 10 different weather band channels and locks onto the strongest one so you can receive the most accurate forecast information. The weather alert will let you know if severe weather is on its way. This set comes with everything you need, including two rechargeable batteries, two boom mic headsets, two belt clips, a 120 volt desktop charger, an AC and DC adapter, and an easy to follow owner’s manual. Final Verdict: With the Midland – GXT1000VP4, you’ll receive two long-range, waterproof walkie talkies that boast weather alerts and durably built. Next up on our list of the best waterproof two-way radios is the Uniden MHS7 Handheld Waterproof VHF Marine Radio. Of all the options featured in our review, this one offers the most waterproof protection. Its JIS8/IPX8 rated, which means that it can continue operating when it’s fully submersed in water. 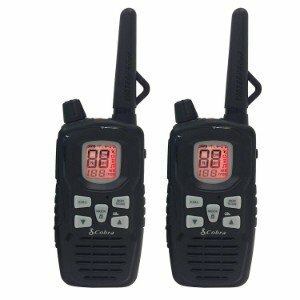 Give how waterproof it is, this walkie talkie is an excellent choice for on the water activities, such as canoeing, kayaking, boating, or any other water-related activity. 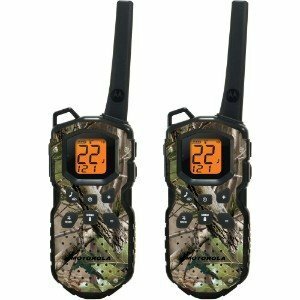 IN addition to being waterproof, this two-way radio also boasts all of the features that you could want or need. It gives you access to all US, Canadian, and international marine channels, so you can stay abreast of current marine activity. Preprogrammed with NOAA weather channels, this device lets you keep tabs on the latest weather forecast. The weather alert will notify you when any severe storms are on the horizon, or if a local or national emergency arises. A Triple Watch mode constantly monitors channels 16 and 19 for signals while you are use whatever channel you have selected. Dual, Triple, and Quad Watch modes monitor two Coast Guard Distress/ Hailing channels, as well as one weather channel, and one standard marine channel. The memory scan feature automatically scans the channels you’ve programmed into the unit. You can also switch between 1, 2.5, and 5 watts of power, so you can opt for short-range or long-range communication. Final Verdict: If you need a fully waterproof two-way radio, the Uniden MHS74 Handheld Waterproof VHF Marine Radio is the option to choose. It’s fully submersible, offers access to all marine channels, receives all NOAA channels, features a weather alert… and so much more! 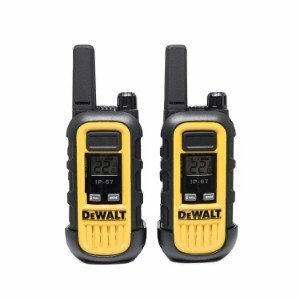 DeWALT is a highly regarded manufacture of various types of communication devices, including ham radios and CB radios, so automatically, you can be sure that their XFRS300 Heavy Duty Business Walkie Talkie is durable and reliable. It meets IP67 standards, which means that it can be submersed in 1 meter of water for up to 30 minutes and it won’t be damaged. It’s also dustproof and shock resistant; it can withstand a 2 meter drop with no damage. In addition to being durable, the DeWALT DXFRS300 is outfitted with tons of great features. It can receive and transmit signals in a space that’s up to 250,000 square feet or 20 floors, so you can stay connected over long distances. There are 22 channels to choose from, and each one is preset with a privacy code, which helps to reduce interference and keeps your conversations private. Voice-activated transmission allows for hands-free use, so you can keep your hands on whatever task you’re working on. There’s a power save feature, too; when transmissions have ceased for10 seconds, the feature automatically turns on to save battery power. It’s easy to read in any type of lighting, thanks to the clear and brightly illuminated LCD screen. The auto squelch turns of the weakest transmissions or the sounds that can interfere with communication, too. Final Verdict: Overall, we were quite impressed with the DeWALT DXFRS300 Heavy Duty Business Walkie Talkies. It meets IP67 waterproof standards, it’s shock proof and dust proof, and it can receive and send transmissions over long distances. The last waterproof walkie talkie featured on our list is the Cobra CXY800 Two-Way Radio. This device is durably built and meets IP54 waterproof standards, so while it may not be fully waterproof, it can resist splashes and light rain. It’s also dustproof, which means it won’t be damaged in highly dusty areas, like worksites, campsites, the beach, and the woods. This waterproof two-way radio has access to NOAA channels, so you can stay on top of the latest weather forecast. If an emergency occurs, such as severe weather, the NOAA alert will sound, so you’ll instantly know when to take cover. The Vibra Alert mode lets you know when transmissions are coming in, as the device instantly vibrates, which is very useful if you’re in a noisy area and unable to clearly hear transmissions. Another notable feature is the call alert, which boasts 20 different tones; choose different tones to distinguish different transmissions for your incoming calls. Voice-activated technology lets you keep your hands free for whatever task you’re working on, and the built-in LED flashlight gives you instant access to light in dark settings. Final Verdict: The Cobra CXY800 Two-Way Radio is a great option for reliable communication in areas where you may be exposed to water and dust. It’s splash proof and dust proof, it features NOAA weather channels and alerts, and it’s easy to use. A waterproof two-way radio is precisely what the name indicates: a two-way radio that won’t be damaged when it’s exposed to water. These devices offer reliable communication in areas where moisture or water may be involved; kayaking, skiing, hunting, rafting, canoeing, boating, etc. There are different levels of waterproofing; for example, some are water resistant, which means that they can withstand splashes of water and damp conditions, while others can be submerged in water, but only for a limited amount of time, and still others can be fully submersed in water for an extended period of time without sustaining any damaged. Consider the type of activities or environment you’ll be using the walkie talkie in to determine what type of waterproofing you need. The range refers to the distance over which the radio can transmit and receive signals. Generally speaking, the longer the range, the better. Weather channels and alerts. To stay up-to-date with the latest weather and emergencies, you’ll want to choose a two-way radio that has access to weather channels and receives NOAA alerts. These devices help to improve your safety, as you will be able to take cover or move in the event that severe weather or another emergency is occurring. If you’re going to be out on the water, you might want to consider investing in a device that can float. If the radio drops in the water, it will be easier to retrieve. In addition to being waterproof, you also want to make sure that your two-way radio is durably built, meaning that it can withstand bumps, drops, dirt, and dust. The more durable it is, the longer it’s going to last. Battery life. This is important for obvious reasons. By taking these factors into consideration, you’ll be able to choose the best waterproof walkie talkie to suit your particular needs. With a waterproof two-way radio, you’ll be able to enjoy reliable communication in all types of weather and when you’re on the water. All of the two-way radios featured in our review are waterproof or water resistant, are durably made, and boast all of the necessary features; plus a few bonus ones. No matter what your needs may be, one of the five waterproof two-way radios featured on our list will be sure to suit them.